A Town Close To Home | The Dacorum Heritage Trust Ltd.
I’m Sam Wood and I’m a sixth form student and Deputy Head Boy at The Marlborough Science Academy in St. Albans. I am currently in Year 13 so I’m studying for my A2-Levels in History, English Literature and Government and Politics. History has always been one of my favourite subjects at school, and now I’m studying at A-Level it is without doubt my number one passion. I visited the Dacorum Heritage Trust during the six week summer holidays to do some of my own further research; as the school year was up but I still wanted to study History! 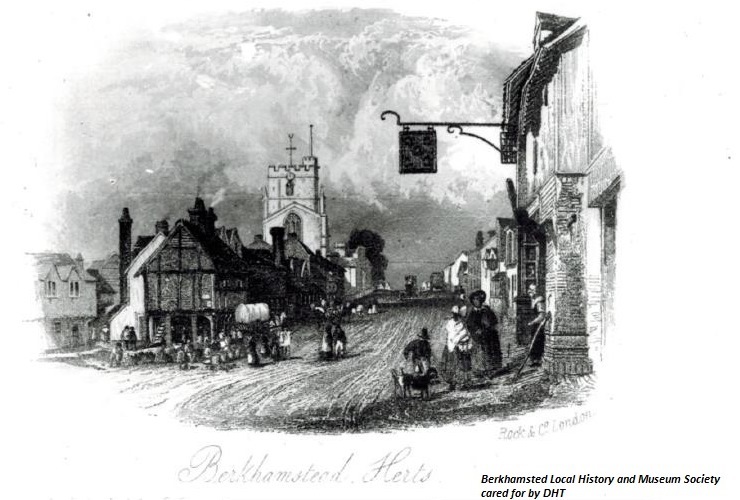 My historical approach to the town of Berkhamsted led me to research why it has ended up the way it has today. I wrote this article after extensive research and diving and delving through archives of letters, leaflets, photographs, maps and more! I would like to say thank you to the trust for supporting my research and facilitating my love for History. I hope my article is thought provoking and that it encourages appreciation of the tightly-knit community of Berkhamsted that we can be proud of today. Why is Berkhamsted such a tightly knit community? For a town that is just a thirty minute car journey from central London, and for one which matured during the industrial revolution in Britain, it is surprising that it is a residential town with such a strong sense of community. Before the question of why Berkhamsted remains such a tightly-knit residential town in the suburbs of London can be addressed, it must first be looked at how the town came about. The town first ripened from its Roman identity in 1066 when William, Duke of Normandy, became King of England after he defeated King Harold at the Battle of Hastings. 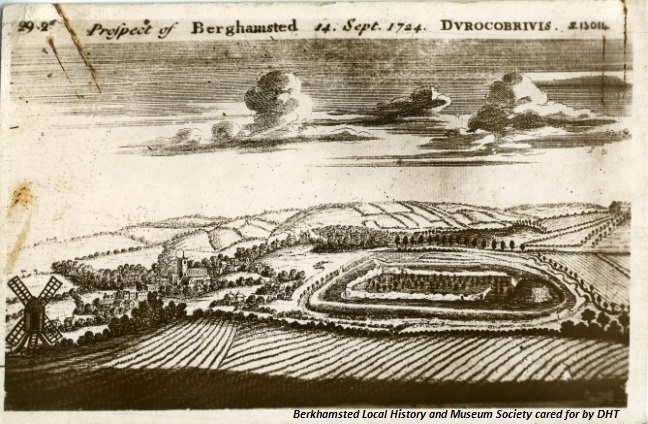 He granted his brother, Robert of Mortain, the Manor of Berkhamsted who proceeded to erect a castle as a defence. Throughout the middle ages this castle was a favourite residence for many members of the nobility, including the son of Edward III; the ‘Black Prince’, Henry II and King John. Yet by the fifteenth century the castle began to fall into ruin. The death of Cicely, Duchess of York, in 1495 led to the castle being abandoned by the royal court and the castle stone was used for building up the local area; hence the ruins that are left today. A town that had “flourished for more than three hundred years”(1) was now silent. It remained almost the same up until around the time of the Victorian period. So, what sparked this ‘Victorian Revolution’ that formed the town we live in today? Firstly, Britain as a whole underwent an industrial revolution and industry thrived as the ‘Malthusian Trap’ had been escaped. This is the idea that the industrial revolution in Britain had the result of greater standards of living and as a result a better economy. Whereas, it is usually the case with the ‘Malthusian Trap’ that such advancements simply lead to population increases and a reversing economy with decreased living standards. The country was therefore in a strong economic position with many booming industries. Berkhamsted then benefitted from this as trade routes, notably from Birmingham to London, such as the Grand Union Canal built in 1798 and later the railway built in 1837 ran straight through the town. Nine out of the one hundred and eight locks of the canal were in Berkhamsted. Trade was therefore massively improved and new industries in the town thrived. The topography of the town also meant that there was an abundance of alder and beech so the timber industry thrived. 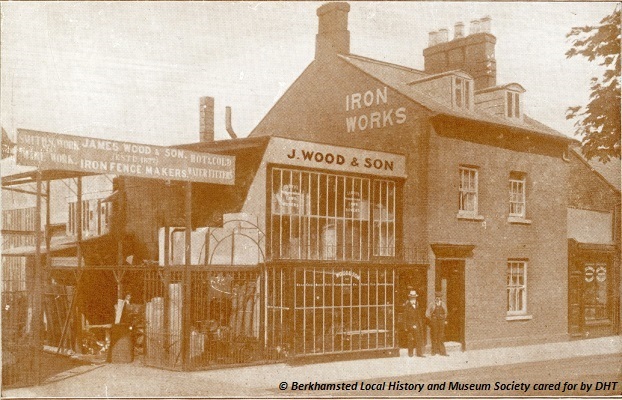 As did other industries such as brush making, boat building and iron working; James Wood set up ‘Wood’s Ironworks’ in 1826 on the High Street adjacent to his home (296-8 High Street).This photograph shows the shop in operation. The town thrived more than it ever had done before. This advancement led to the building of housing and the reviving of schools to cater for the population increases in Berkhamsted. The school for example saw changes under Dr Bartrum’s business-like administration (1864-87) when new classrooms and even wings were added, as well as a new chemical laboratory and a carpenters shop. In 1866 it received a generous donation from Lord Brownlow of £4,000 and a swimming bath, a gymnasium and a chapel were later added under Dr Fry’s administration. Residential expansion can also be seen with the layout of the town. 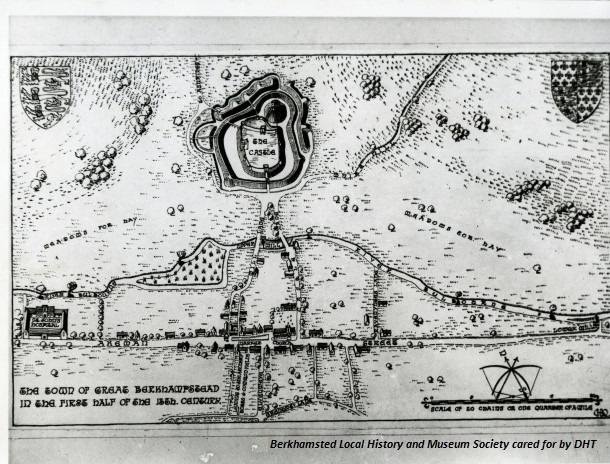 Up until the mid-nineteenth century Berkhamsted still only really consisted of the High Street, Mill Street and Castle Street, as shown on this map from the thirteenth century, and this postcard from 1724 which shows an aerial shot of the town. Notice how these images are almost identical in terms of the development of the town. Further still, the age of the town is evident with these sources; notice how the High Street, originally Akeman Street in the Roman period, runs straight through the town. This is a classic Roman build designed to shorten the distance for travelling. Properties on Castle Street, Mill Street and the High Street are also much older than properties elsewhere. Many of them have beams and overhanging second floors or ‘jetties’ that mark their age. Houses used to be built with this feature as a way of increasing living space and as a mark of wealth and status. This engraving of the town in 1857 shows this architectural feature. Take a look at the end building on the row of buildings running from the church. Houses on newly built streets are absent of such features. For a town that reached maturity during the industrial period it is still remarkable that it remains a residential and not an industrial town and therefore a tightly knit community in the suburbs of London. Yet the answer to this lies predominantly with the location of Berkhamsted. That is, the town is a stop-off point in between larger cities and not necessarily a town for industry itself. An article from 1960 explains the controversy over the future of Berkhamsted. The issue was with the row of buildings from the “One Bell” public house to the Church, as many called for them to be demolished in order to restore the High Street to its “former spaciousness and dignity” as said in the article. The photo of the town from 1857 will highlight this kind of “spaciousness and dignity” that was spoken of such as the very wide High Street. This kind of opposition to the town’s development shows the residential essence of Berkhamsted; with some inhabitants not even wanting an expanded High Street from the previous beauty of the “little village green” the town is clearly not fit for being an industrial town. Berkhamsted certainly is a town of many homes and a town close to home at that. The town still has a strong sense of community despite it being revitalized by industry. It is simply ironic that a town which grew from industry boasts of a cultural residential community in the suburbs of London. By Sam Wood, Sixth Form Student from The Marlborough Science Academy, St. Albans.